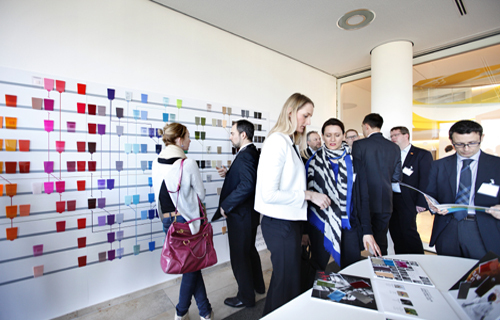 Muttenz, March 11, 2015 – Clariant, a world leader in specialty chemicals, today celebrates the 10th anniversary of its ColorForward® color forecasting guide with a day-long customer event at the Clariant Innovation Center in Frankfurt, Germany. More than 50 key customers from around the world are attending. It is fitting, then, that the ColorForward 10th anniversary is being celebrated at the Clariant Innovation Center (CIC). The CIC building in the Industriepark Höchst, near Clariant’s largest manufacturing site in Frankfurt, was founded to empower R&D innovation. The 36,000 square meter center employs around 500 and houses competence centers in chemical research and process technology as well as application laboratories for several Business Units and state-of-the art analytical laboratories . The modern, open-plan building features a mix of open workspaces, offices and laboratories to foster the exchange of ideas among employees as well as with visiting partners from industry and academia. A highlight of the anniversary event is a presentation on trend watching and innovation by Dr. Carl C. Rohde, a Dutch sociologist and head of Science of the Time, one of the first and most respected trend research and innovation agencies in the world.